Photos of roller coasters demonstrate the range of dips, curves, drops, loops, and spins that these scream machines can deliver to adrenaline seekers. While some popular coasters are replicated many times, most coasters have unique layouts that offer a range of thrills, from kiddie coasters to family rides to extreme thrill machines. To see the full variety of coaster types and photos from all angles, potential riders should check out official park websites and fan sites before visiting. The following pictures showcase a range of popular coaster designs and what makes the rides unique, such as intertwined elements on Medusa. 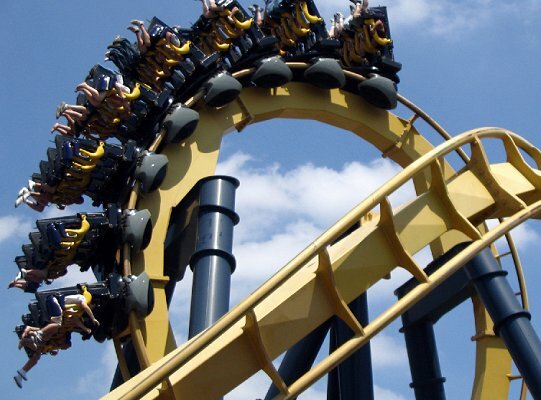 Inverted coasters are popular designs. Busch Gardens’ Kumba is a thrilling looping coaster. Twin coasters are nostalgic designs for wooden coasters. Kingda Ka is one of the fastest coasters in the world. Wooden coasters frequently have undulating hills. Two loops are better than one on Loch Ness Monster. Xcelerator at Knott’s Berry Farm is a thrilling ride. Small coasters use thinner tracks. The Boomerang is one of the most common track designs. Wild mouse coasters use many hairpin turns. The Hulk at Islands of Adventure is a thrilling launch coaster. X2 at Six Flags Magic Mountain is a fourth dimension coaster. Kong at Six Flags Discovery Kingdom is a classic Vekoma SLC. For more coaster photos, be sure to read Pictures of Roller Coasters and Roller Coaster Video Clips, and check out the Pictures of Cedar Point Coasters Slideshow for images of some of the most highly rated coasters on the planet.